Up to 16 participants . Open to everyone. 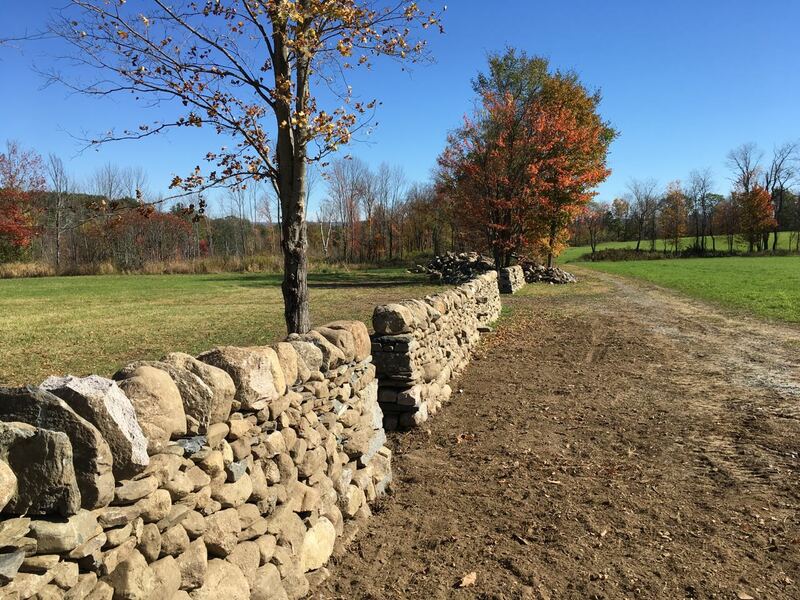 Set on a 200 acre property of field and forest, this is a fantastic location to learn the craft of dry stone walling. 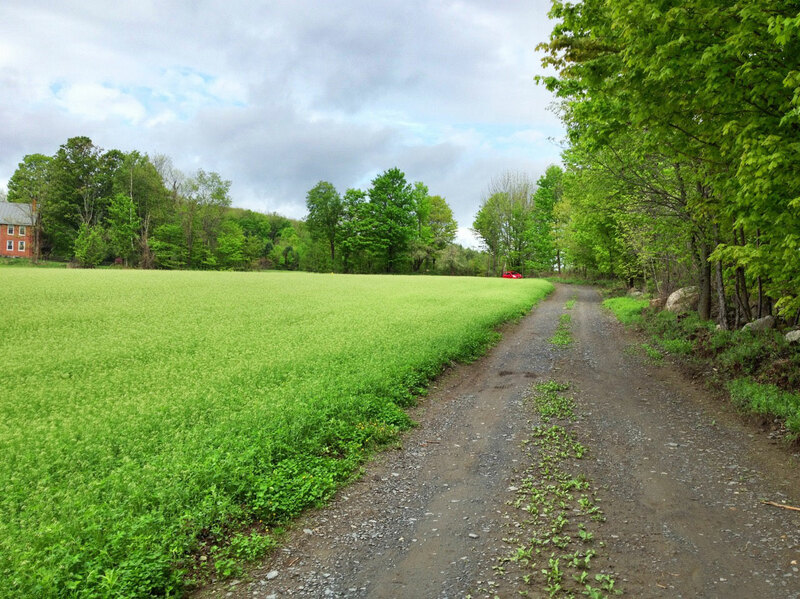 The property includes active farm fields, actively managed forestland, trails, a beaver pond and wetland, and even a waterfall. There are fantastic views in nearly every direction. 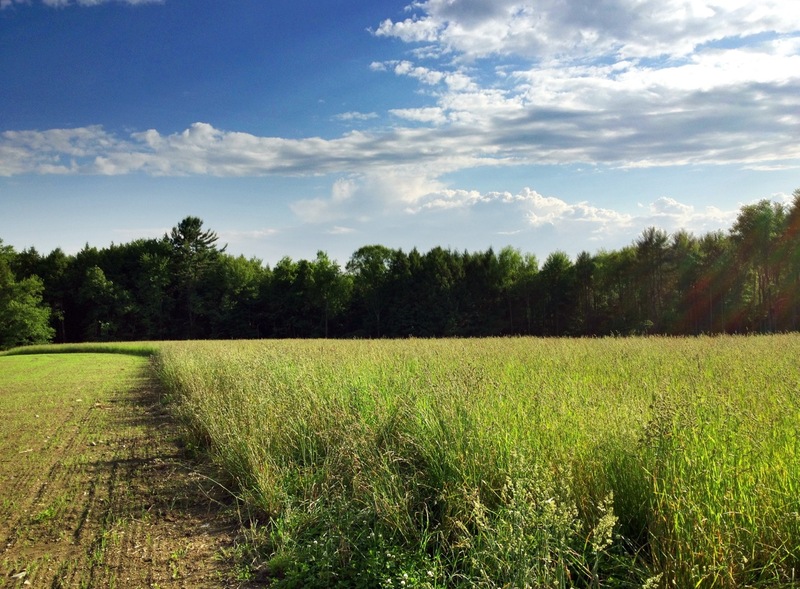 A truly beautiful Vermont landscape. Actively farmed for over 200 years this property is near the heart of the historic village of Eureka (now gone), which was the first village within the town of Springfield. 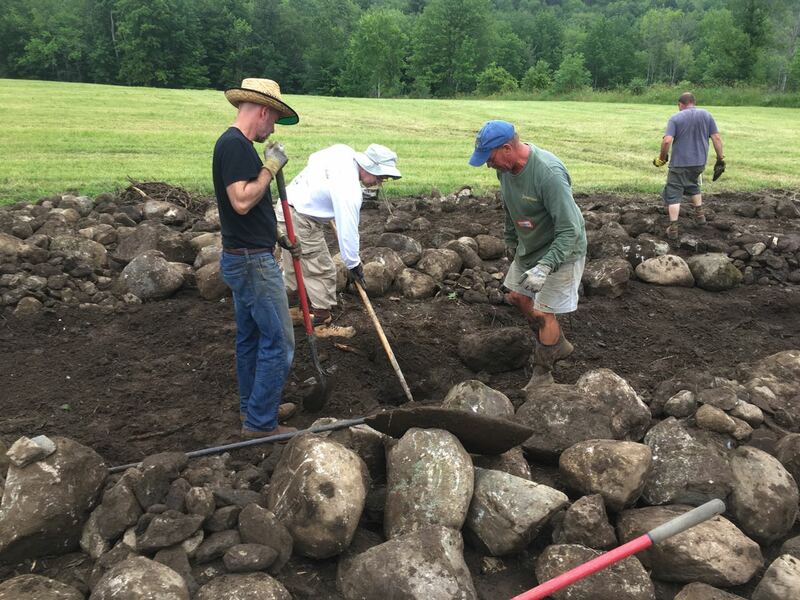 The site features 1000’s of feet of historic dry stone wall that will begin to be repaired in workshops. The stone used for the walls is what was gathered right out of the fields. It is a mixture of the local metamorphic ledge along other types brought in by the glaciers long ago. There is a nice mix of shapes from round to irregular with occasional flat ones as well. It is very typical of the stone found throughout much of New England. This workshop will be based in the real world. How to work with the stone you have in the best way possible is a primary focus. 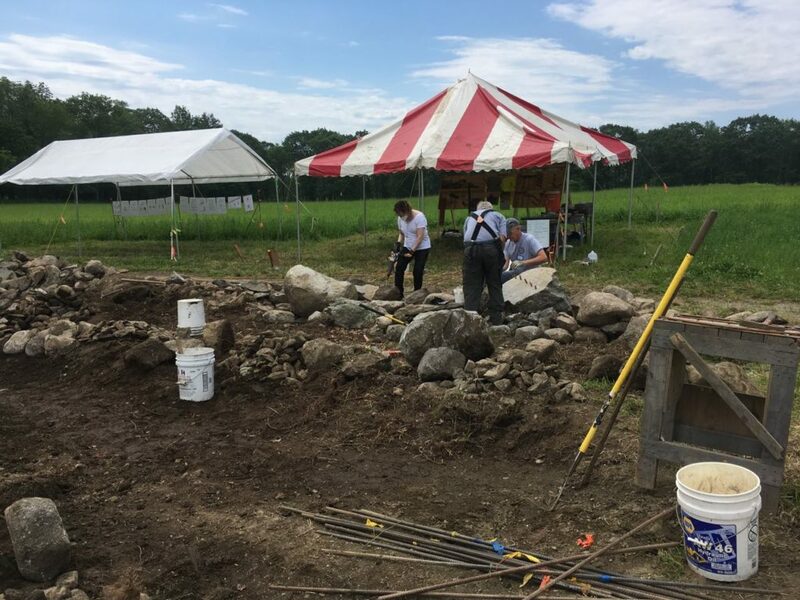 This is a site preparation workshop that is intended to be paired with the dry stone wall building workshop happening on the following two days. This workshop can also be taken independently of the weekend wall building workshop. The workshop will run from 9 – 5, with a break for lunch at noon. The instructors will use a variety of visual teaching aids, discussion, and hands-on demonstrations. 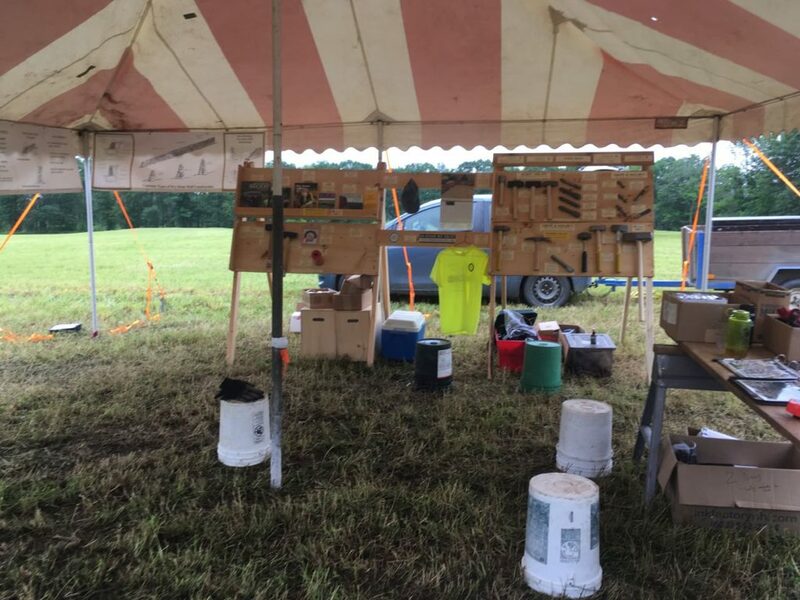 In this workshop participants will learn the needed site preparation for building a wall. 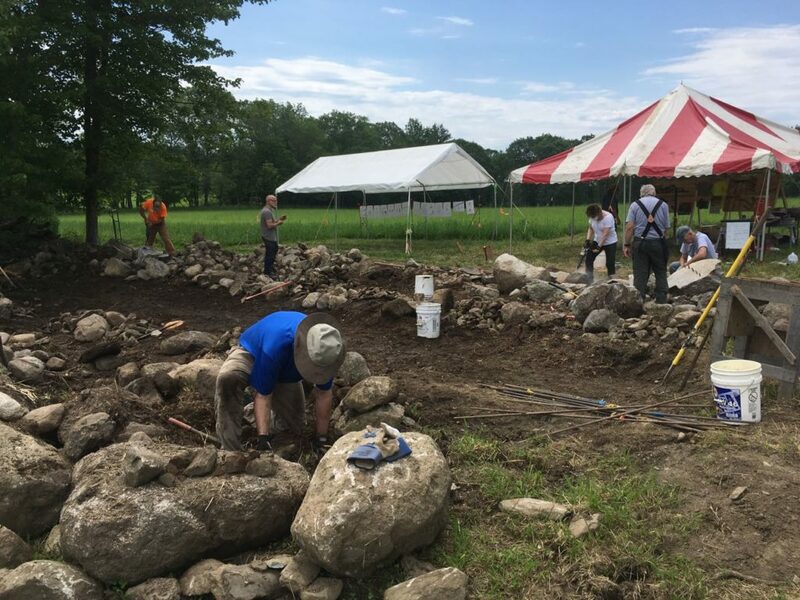 Participants will be lead through discussions of sourcing and selection stone to use, and preparing the foundation. 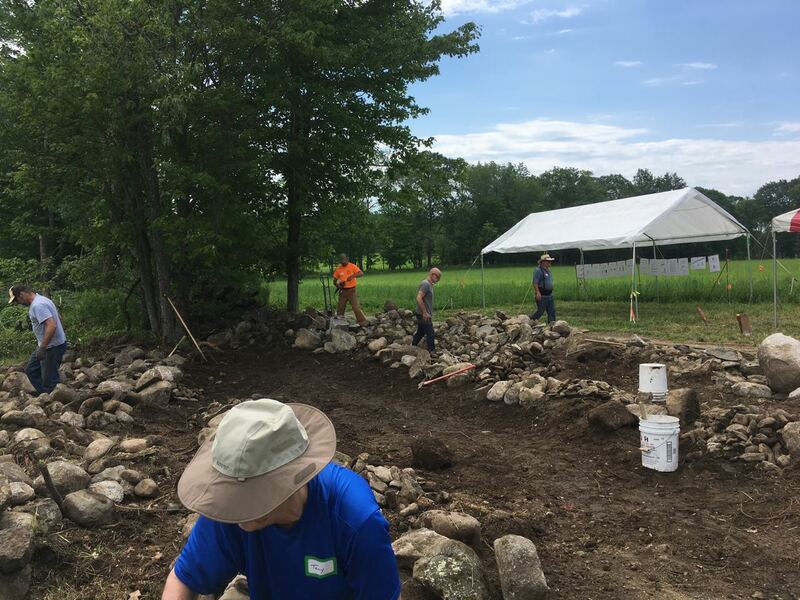 For the better part of the day, participants will be learn from and working along side the instructors setting up batter frames and sorting stone for building. Knowing how to efficiently build sturdy batter frames and understanding how to use string lines are two of the trickiest aspects for many dry stone wallers. This will be discussed in detail. 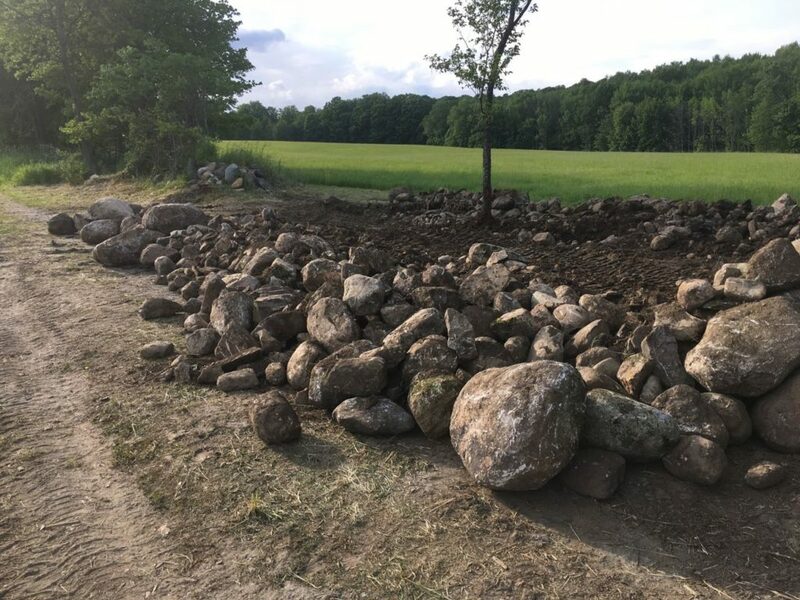 There will likely be some very large stones to deal with and methods of moving them and braking them down will be shown and used. Some other shaping will also likely be demonstrated and taught to facilitate making the best use of the material. No experience is required. There are no prerequisites for this workshop. Those who have previous experience will be challenged with harder tasks. Even experienced wallers can learn a tremendous amount from this workshop. Hilary’s journey with stone started in Kansas at her grandparents’ 1884 limestone house on the prairie. 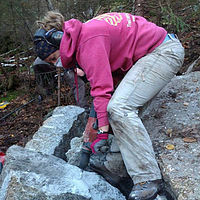 She is certified with the Dry Stone Walling Association of Great Britain and with the Dry Stone Conservancy. Get updates about workshops, building tips, and much more! The Stone Trust sends out an email newsletter one a month along with weekly updates Click here for the archive of our past newsletters! 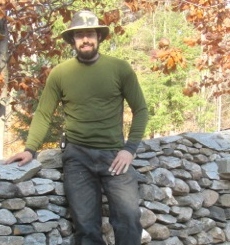 Check out the corresponding Saturday-Sunday Dry Stone Walling workshop. June 9 & 10. 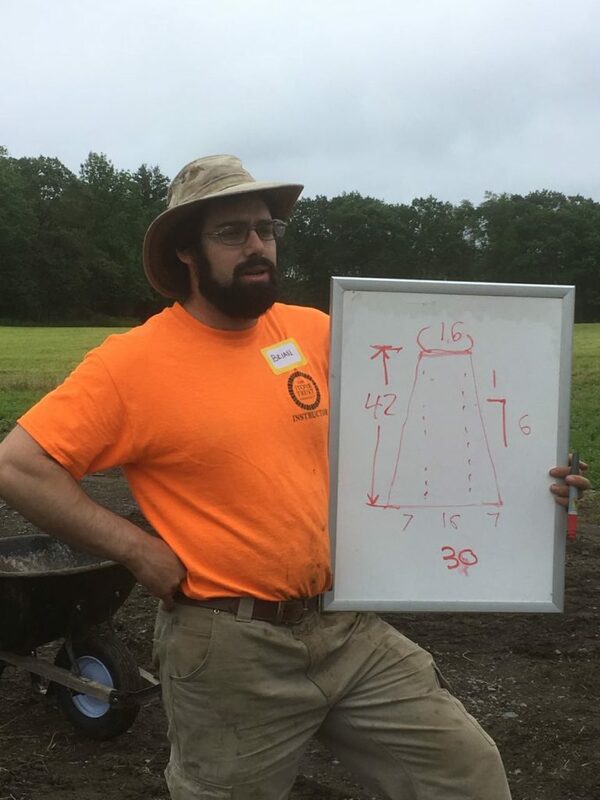 Sign up for both to get 3 days of amazing dry stone wall education! Basic Membership is Just $75/year! Check out all the membership levels and benefits here! Click here for places to stay, eat, and local attractions near by this workshop site. 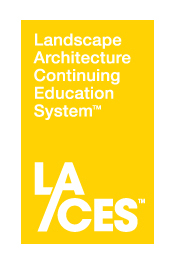 Licensed Landscape Architects can receive 7.5 LA CES credit hours for attending the site prep workshop day and and 15 credit hours for the two day walling workshop. Take both for 22.5 credit hours, almost 2 years worth in 3 days! 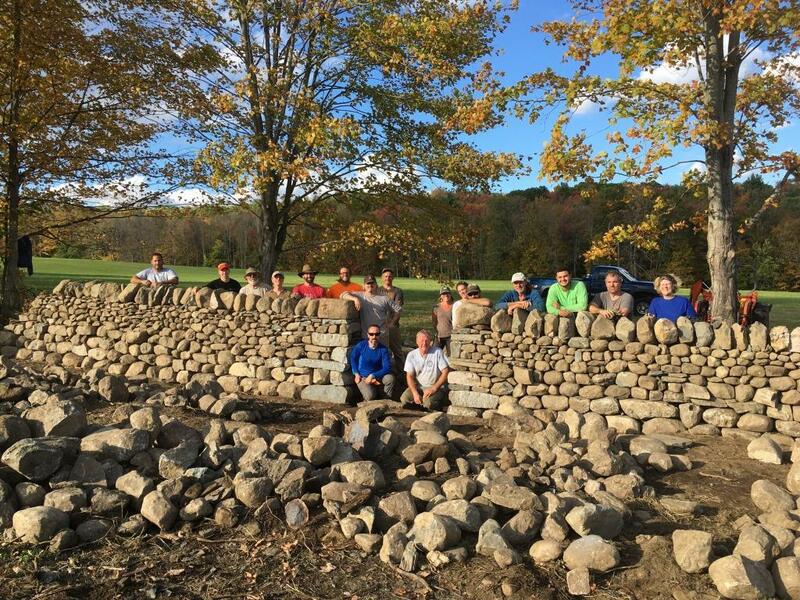 These workshops make a great break from the office and you will come away with an incredible knowledge base about dry stone walls that can be applied directly to your projects! This workshop will take place at the far end (where it looks like a rock pile) of this wall built by the previous workshop. 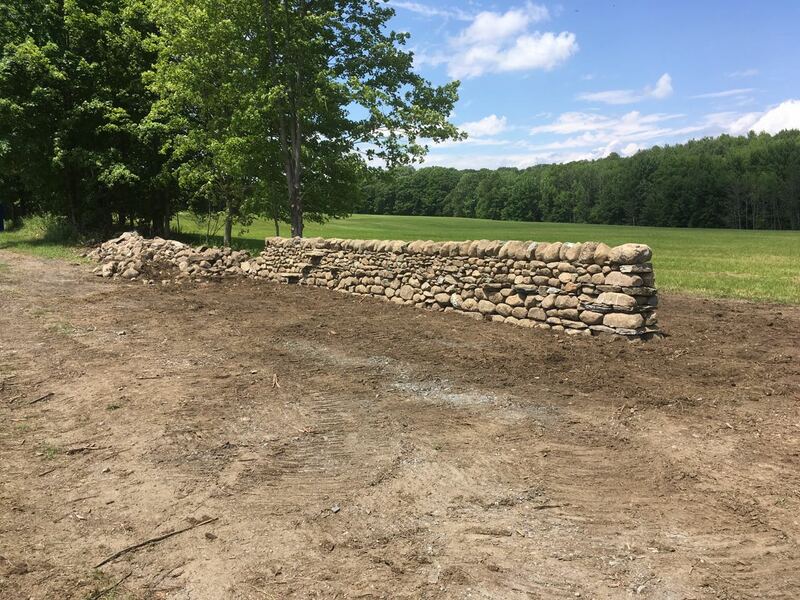 Set on a 200 acre property of field and forest, this is a fantastic location to learn the craft of dry stone walling. The property includes active farm fields, actively managed forestland, trails, a beaver pond and wetland, and even a waterfall. There are fantastic views in nearly every direction. I truly beautiful Vermont landscape. Actively farmed for over 200 years this property is near the heart of the historic village of Eureka (now gone), which was the first village within the town of Springfield. 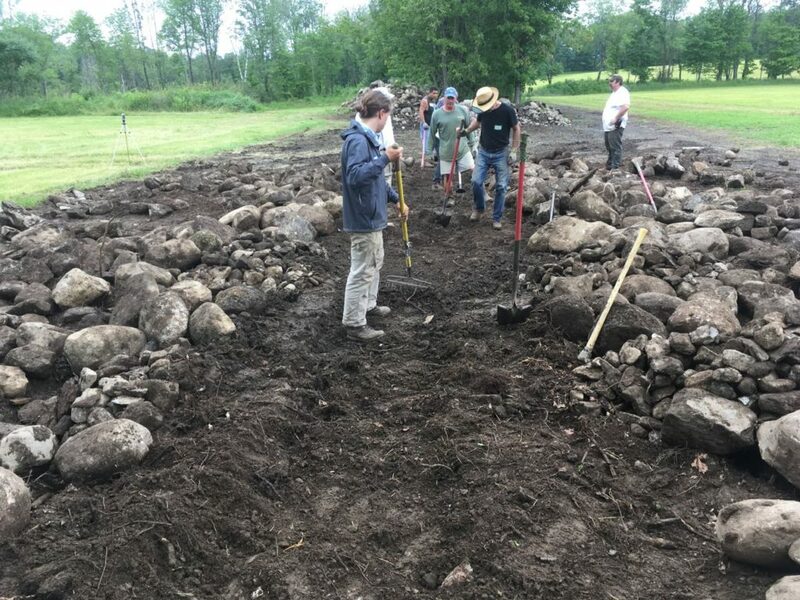 The site features 1000’s of feet of historic dry stone wall that will begin to be repaired in workshops.